Ieke Trinks was born in the Netherlands in 1977. She lives and works in Rotterdam. She holds a Masters of Fine Art at AVK St Joost in the Netherlands (2008). 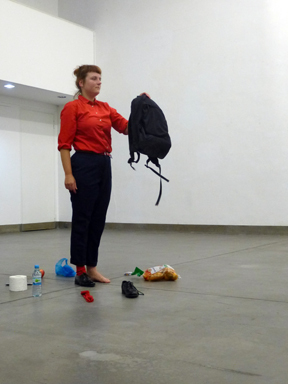 Her performance work is often a created using instructions, observations, and live actions made with every day objects and materials (such as cups, chairs, paper, shoes, doors, wood, shirts, nails, bananas, plastic bags), combined and deconstructed, often resulting in absurd situations that play with interpretations and expectations in response to a particular written text. Ieke’s work has presented in various venues in Europe and South America. She is part of a performance collective called TRICKSTER that works with “emergent-form composition’”, and since 2009 she has co-produced PAE (Performance Art Event) in Rotterdam. order of things. 2012. Béatrice Didier.